Fate, destiny, fortune. How much can we blame the fates or rather how much responsibility should we accept for our own destinies. 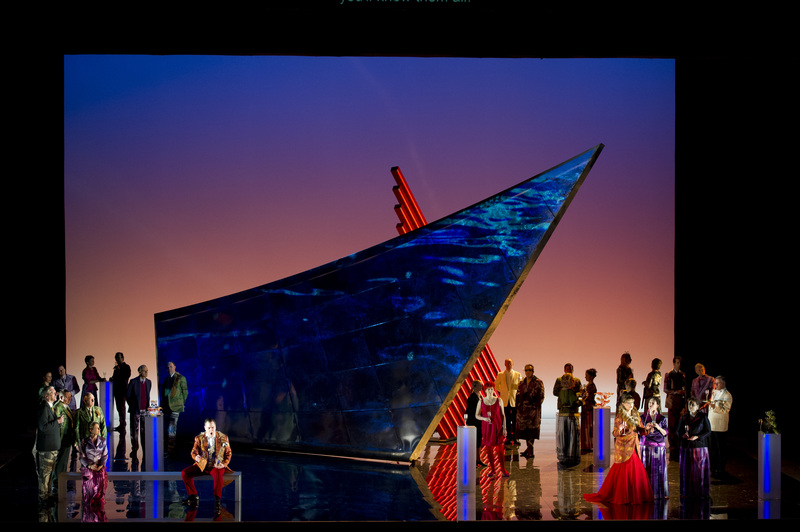 Miss Fortune is Birtish composer Judith Weir’s first operatic composisition in the last 17 years. She had taken a hiatus to focus her energies on a host of other endeavours including orchestral composition and leading the BBC’s annual composer weekend at the Barbican in 2008. Now she returns to the stage at the Royal Opera House. Miss Tina Fortune, Emma Bell, was first shown at the Bregenz Festival in Austria last summer. The storyline is Weir’s re-working of a Sicilian folktale. Lord and Lady Fortune lose their money in the stock-market crash – sound familiar? Miss Fortune refuses to continue a sheltered existence and so when her parents flee via helicopter, she chooses to stay behind and make her way in the world. We see her in a sewing sweatshop, at a fast food van, then ironing in a dry cleaners. Each endeavor ends in catastrophe due to the fact that Fate countertenor Andrew Watts, and his hip-hop crew are following close on her heels. Finally Tina visits this rapscallion Fate and begs him to leave her alone – she then goes on to win the lottery, find her parents, and fall in love with a handsome rich young man who loves his shirts to be well ironed. The story line is unbearably weak. Does it say that a woman’s only two ways out of poverty and destitution lie in either winning the lottery or marrying a rich young man? Did a woman composer really think this scenario worthy for the operatic stage? There is no depth to this surface deep tale – Tina Fortune wanders aimlessly. There is no real suffering from what I can see, only a lack of any real character and a preference to let fate rule her life while she sits and moans about it. She ruins peoples lives, yet wanders along merrily in her own. The grand stage settings designed by Tom Pye provide spectacle, but little else. Weir’s libretto is tedious in its simplicity and lack of engagement with the full capacity of the English language. The music was charming, but unmemorable. Paul Daniel and the orchestra carried on honorably and gave the torpid notes gusto. Fate, played by Andrew Watts, I must say, is the downfall of the show. His dancing attempts are actually comical. The lightning colored pajamas that look like a sleeping costume purchased from Primark were ineffectual. His hip-hop break dancing crew was poorly thought through. It could have been a great addition, but leaving them in street clothes and failing to integrate them into the operatic world in any real way kept them in the periphery as a sideshow.